If you look up for Bengali Cuisine then you will find Wikipedia saying that " It also has the only traditionally developed multi-course tradition from the Indian subcontinent that is analogous in structure to the modern service à la russe style of French cuisine, with food served course-wise rather than all at once." Yes Bengali meals are probably the only multicourse meals where proper sequence is followed as per the rule of Ayurveda. But not only this if you look closely you will find a sequence is followed in everything from how the dishes would be placed on a plate or how the plate itself is placed in front of the person. Yes there is a traditionally approved method for all this. I remember while shooting for the show Rocky and Mayur's food express I asked Rocky to turn the plate so that the mound of rice is placed on his left. 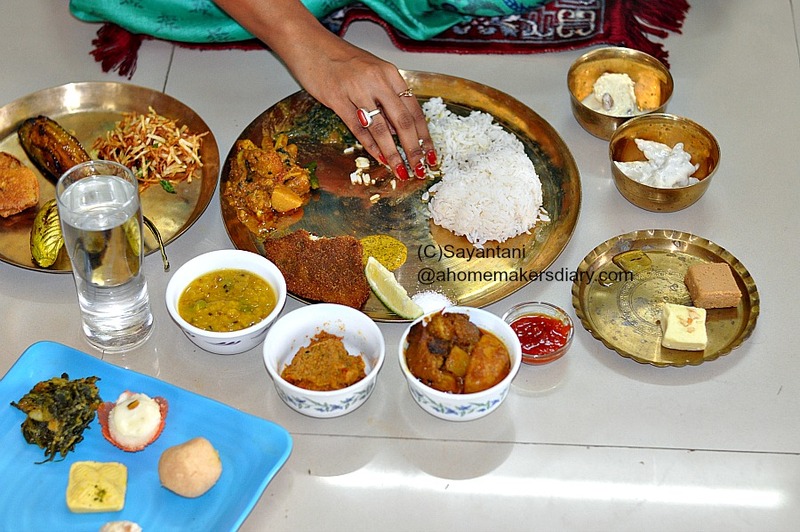 Look at the Thalis in the following picture. We keep a little place at the bottom of the plate so that following the traditional way we could mix each dish with a little rice to consume and taste everything separately. Generally the course progresses with a thrust on lighter to richer dishes. 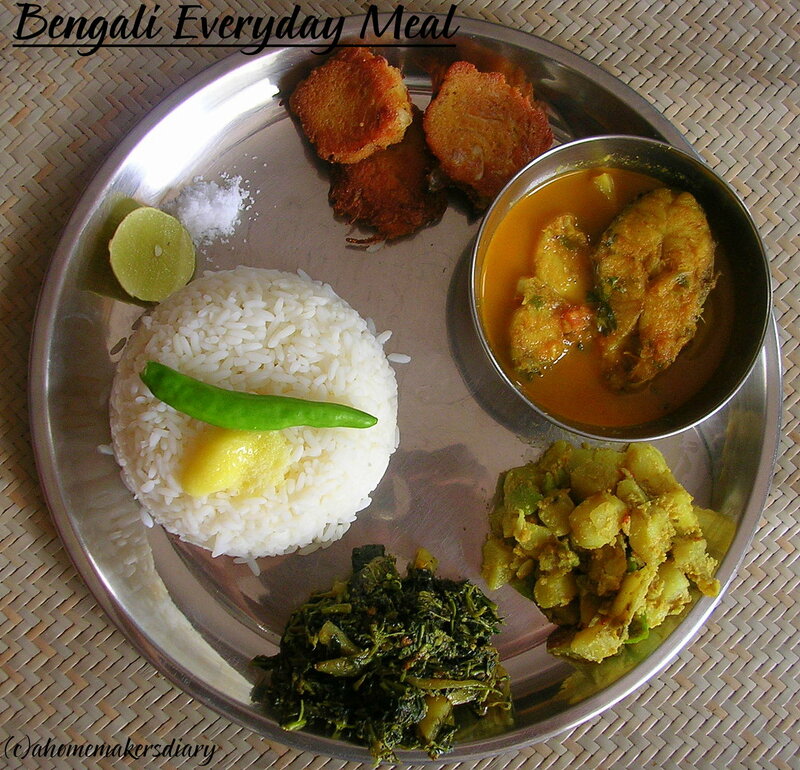 Also to do justice to the vast array of local and seasonal vegetables, us Bengalis believe to have one of everything on the plate for our well being. 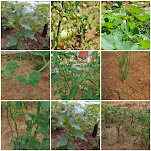 The meal starts with a bitter vegetable (Shukto) or a leafy green dish aka Shaak charchari, known to cleanse your palate and keep you healthy with its medicinal values. Next comes the Dal with various types of bhajas or fries. A more complex and richer curry like alu fulkopir dalna in winter or jhinge alu posto in Summer follows next. The famous fish course comes next, which could be a single preparation of everyday fish stew or a much richer. complex macher kalia. For special occasion the next course is reserved for the meat curries. Rich, spicy and soul satisfying. Next comes a sweet and sour Chutney or Chaatni as we say in Bengali with some deep fried Papad. and the famous Bengali dessert of Doi, Mishti or Payes comes at the last to end the meal on a sweet note. 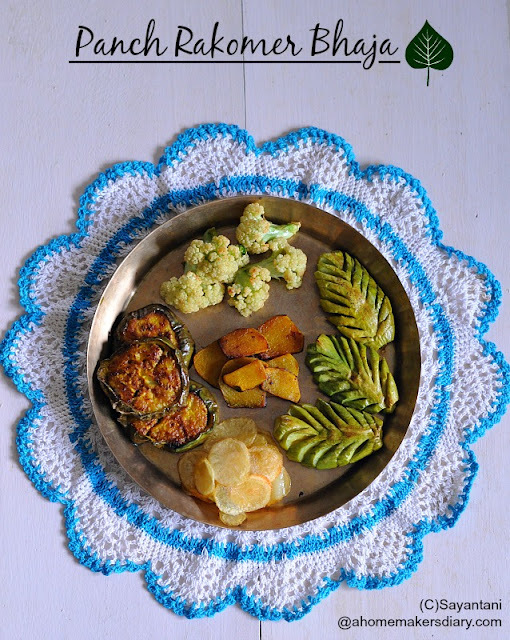 Today I will share my recipes of five types of Bhaja, which for some reason we Bengalis believe to be auspicious for any celebration. So whenever we are preparing a celebratory meal for birthdays, weddings or first rice ceremonies we always prepare and serve 5 types of bhajas. There are also occasions when more than five tpes are to be served. In our family a would be mother gets three baby shower parties (Saadh bhakhon) on completion of her 5th, 7th and 9th month. and On each ceremony she is at least served that many types of bhajas, fruits and sweets. Like for 7th month the Saadh er Thala (baby shower platter) will include a minimum of 7 types of fries, sweets and fruits. Bhaja literally means fried in Bengali. It could be anything from a simple stir fry, deep fry or batter fries. 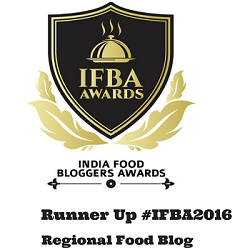 Though the last one has it's own position in the culinary map and is famous under the name of Telebhaja (literal meaning deep fried in oil). 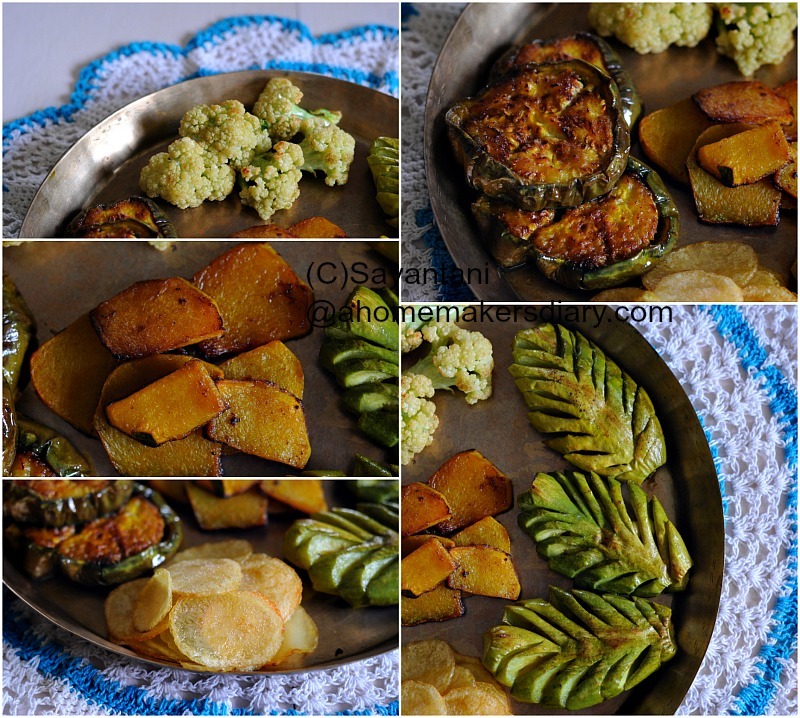 This panch rakomer bhaja or five types of fries generally do not include batter fries rather seasonal veggies are deep fried with minimum spices. 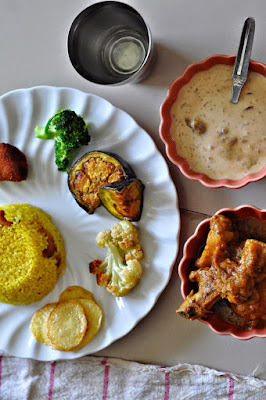 Eggplant, Potatoes and pointed gourd (patol) are very common bhajas on bengali platter but on special occassions we also do fry other seasonal veggioes like cauliflower, pumpkin, plantain (kanchakola), okra (dhyarosh) or bitter gourd (karola). Noted below are the most simplest recipes of bhajas which is pure bliss when combined with Dal and rice. Peel the potato and slice in semi thin (1/4 centimeter!!!) rounds, you can also use a mandolin but I prefer to cut them with a knife. Submerge in water and keep aside. Cut thick slices (1/2"-3/4") of the eggplant. Best to prepare the eggplant just before frying. Separate the florets from the cauliflower. Place in a bowl of salted water for 5-10 minutes. Discard the water, wash the florets under running water and then boil with a pinch of salt for 5 minutes. Drain and keep aside. Peel and cut 1" wide thin slices from the pumpkin. Keep aside. The pointed gourd could be just scraped and sliced in half after discarding the ends. Or you can put a little more effort to cut them in this leaf shape. I find our very own cutting device Bonti most useful when I prepare my pointed gourds this way. You can also use a knife but you need to be careful to cut thin slices. First scrape the skin of the pointed gourd by running the knife back and forth on the surface. Discrad the ends. Starting from the top start slitting the gourd till the middle. Do this every 1/2 cms away in a horizontal manner till you reach the other end. Folow the same on the other side of the gourd as well. It definitely needs some practice and patience. Once your veggies are prepared smear little salt on them. For the pointed gourd and brinjal also add some turmeric for colour. Rub the spices properly to coat them evenly. Depending on you preferences you can shallow fry or deep fry the pumpkin and eggplant till they are golden on all the sides. I always shallow fry these two vegetables. For the patol, potato and cauliflower the best result come from deep frying so heat enough oil in a heavy bottom pan and deep fry the veggies till they are cooked through and are golden on the outside. Keep the heat on medium for an even cooking. Always cook the pointed gourd or Patol at the end as it tends to make the oil black. Drain the excess oil and absorb on kitchen paper. Serve hot or at room temperature with Rice and Dal or even with Khichudi. There are many ways you can fry Alu or make alu bhaja. Will post more about it later. 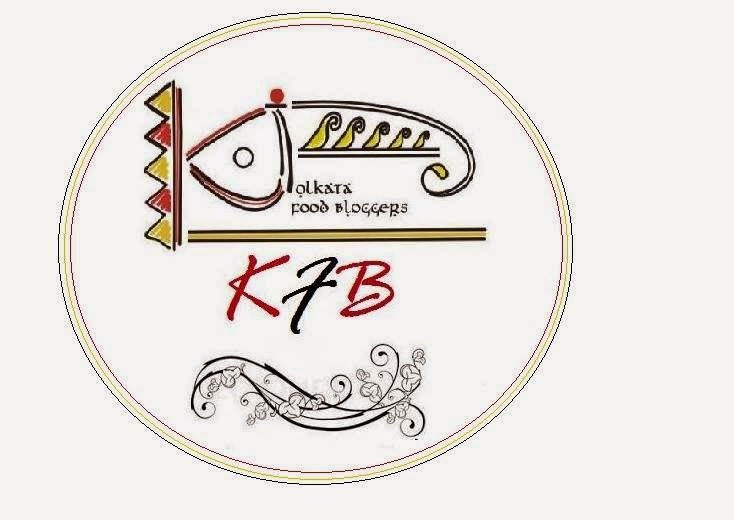 Sending this to KFB's Pujo Special 2015 event. Jonmodine bhaja r thala must chilo... Amader barite er songe bori r narkel bhajao dewa hoto... Potol bhaja ta vison sundor lagche.. This looks like a spread for a queen - yummy! !